This excerpt comes from "The Service of Confession with Supplements for Preparation." This booklet prepared by the Greek Orthodox Metropolis of Denver Office of Youth and Young Adult Ministry provides both the service prayers and this wonderful walk through the Beatitudes by Fr. Thomas Hopko. What is sin? The Greek word for sin, amartia, means “to miss the mark.” As Christians, our “mark” or the “target” for which we “aim” is a Christ-like life, lived to the best of our ability according to the teachings, precepts, and commandments of God. When we miss this mark or fail to hit this target, we sin. Murder is a sin. Pride and envy are sins. Stealing a car is a sin. Stealing a candy bar is a sin. Refusing to attend the Liturgy is a sin—but so is attending the Liturgy with hatred for others. Missing the mark is missing the mark. If we aim at the bullseye and miss, it makes no difference if it is by an inch or a yard. In both cases, we have failed to achieve our goal. There are many ways to prepare for confession. Often, a person will spend time in contemplation of the sins they know, perhaps working to make a list of them, and also spend some time praying to be shown those sins they don’t see -- for we all sin in ways we don’t even realize. You can find different lists of sins and writings to help you think of the various kinds of sin you might consider repenting and confessing. Some are based on the Seven Major Sins (Pride, Covetousness, Lust, Anger, Gluttony Avarice, Sloth), some are based on Ten Commandments or on other Scriptural readings, and some are just lists of sins known to be common. The goal is to help you examine your own heart, and to find those sins that you need to bring to your confession. Fr. Thomas Hopko of blessed memory wrote a beautiful self-examination based on The Beatitudes. The questions are offered as a general indication of what our approach should be. Am I poor before God and men? Do I cultivate the attitude of poverty? Do I realize that all is God's and from God? Do I use my life and everything I have as that which belongs to God? Do I share the goods of the earth with others, knowing that all is God's? Do I take my opinions and ideas from God? Do I acknowledge my spiritual and intellectual poverty before God, accepting his wisdom and truth? Am I possessive, selfish, self-satisfied, self-righteous, self- seeking? Am I an idolater of my own opinions, ideas, possessions? Do I lust after status, power, authority, wealth, position? Do I really love and value poverty as the perfect ideal? Am I a person who mourns? Do I lament over the suffering of men? Do I weep over the troubles in Church and state, family and society? Do I suffer with all who suffer, in poverty and squalor, in misery and sin? Do I weep over sickness, disease, tragedy, and death? Or do I simply "take it as it is", passing off as courage what is really hard-heartedness and lack of sympathetic concern? Do I have compassion on the lowly, the lustful, the addicted, the selfish, the wretched, the evil and sinful of the world without judgment or condemnation? Am I sad over the sins and of others? Or do I, in fact, laugh and gloat and mock the faults of others, and take perverse pleasure in those things about which true Christians,in imitation of Christ, can only mourn? 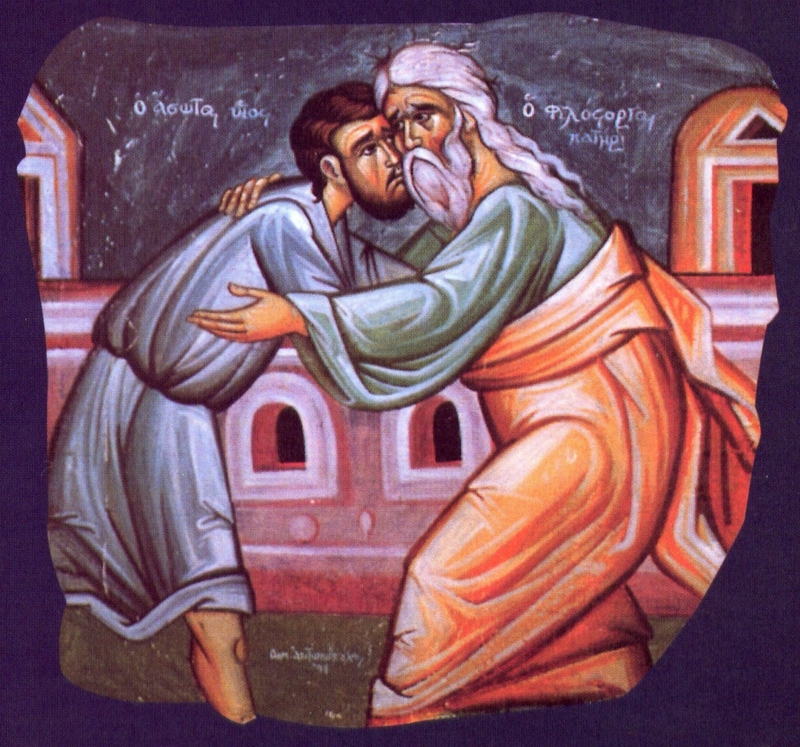 Am I meek with the meekness of Jesus? Am I meek in the sense that I only fight evil with good? Do I accept and practice the fact that humble love and truth and courage in goodness is the only weapon available in any battle with sin and sinful people? Do I lord it over others, at home, at work, at church? Do I love and actually use force, brute command, blind authority, intimidation, coercion, to accomplish my will? Do I bless those who curse me, pray for those who abuse me, do good to those who hate me, serve those who misuse me, speak to those who shun me? Do I love my enemies and forgive my offenders? Do I believe in the method of the meekness of Christ as the only way for genuine achievement? Do I hunger and thirst for God? Do I desire to be righteous? Do I work to be holy? Do I read or study or make any continued effort for love and for truth, for the Spirit of God? Do I pray? Do I fast? Do I read the Holy Scriptures, the Holy Fathers, the lives of the Saints, and other spiritually profitable works? Do I do any "spiritual exercises" which train me in goodness? Do I come to Church? Do I participate in the Mysteries? Do I go out of my way to help, to teach, to serve in some way? Do I do the things which I know bring righteousness? Do I show mercy to others? Do I forgive those who offend me? Do I try to understand those who are different? Do I take pleasure in judging and condemning? Do I talk about others? Do I revel in gossip? Do I say things, though possibly true, which need not be said but only can harm? Do I rejoice in wrong? Am I legalistic, loving the law more than the Spirit? Do I cover offenses, or do I stir things up by picking and condemning? Am I petty and small? Do I slander and shame? Am I prejudiced, making judgments and coming to conclusions without proper facts but with pre-formed opinions? Do I actually prefer strict judgment to tender mercy? Do I love purity, cleanness, and wholeness? Am I polluted by filthy thoughts and words and actions? Is my mind stained by demonic rationalizations and prejudices? Or am I pure in my openness to all that is good? Is my body corrupted by beastly sensuality and lust? Are my thoughts and deeds pure, or are there always hidden motives and intentions? Am I trusting and trustful, with a singleness of purpose and total integrity in everything? Or do I connive and deceive, cheat and lie? Am I hypocritical and pretentious? Am I caught by some passion: eating, drinking, smoking, working, playing, sleeping, or something else which has more control over me than I have over it? Is there any darkness or impurity which blinds me and holds me from freedom and wholeness with God? Do I love and make peace? At home, at work, at church, in society, and the whole world? Am I angry and impatient? Preparation for Confession -- 12 Do I look for fights and arguments? Do I provoke others to anger? Do I believe in turning the other cheek? Or do I take refuge in physical force? Do I love violence? Do I worship aggression and power? Do I seek inner peace and quiet which is the basic condition for peace in the world? Am I ever persecuted for what is right? Am I ready to be? Am I ready to give my life, without vengeance, for what is true? Do I participate in good activities which may bring criticism from others? Or do I take the easy road of non- involvement in human affairs, in family or job or churchroad of non-involvement in human affairs, in family or job or church or society at large? Do I go along with things which are wrong from fear or cowardice or laziness? Do I flee responsibility? Do I worship security? Am I defending my own small life in contradiction to the righteousness of God? Am I, in fact, ashamed of Christ? Is my joy and gladness in God? Or Is it In this world with its passions, powers, possessions, and praise? Am I mean and grouchy or jealous and moody? Am I despairing and without hope? Am I pessimistic and anxious? Do I complain and spread darkness and irritation to others? Is my faith of no consequence in my actions and attitudes to the events of life? Do I really consider the lilies of the field and trust in God and rejoice in this trust? Is my treasure in God or in myself? Is my life hid with Christ in God, or am I, in fact, a man of this age in body, mind, and spirit? Do I believe and have in truth the “joy of believing”? 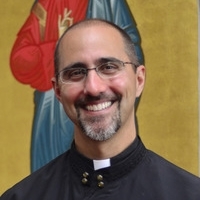 Father Evan is the priest of Saint Spyridon Greek Orthodox Church in Loveland, Colorado. He and his wife Presbytera Anastasia are the happy parents of three daughters, Alexia, Eleni, Maria, and a son Spyridon; they live in beautiful Fort Collins, Colorado where they ski, flyfish, and hike.